MARK WORRINGHAM was the Roadrunners’ hero at the Brighton Marathon, finishing 13th in a field of nearly 20,000. The former club men’s captain took nearly four minutes off his personal best, coming home in a time of two hours, 32 minutes and 46 seconds. His successor as men’s captain, Phil Reay, led the tributes to his star vet. “Like a fine wine, Mark just gets better with age,” he said. “To run a marathon in that time and take almost four minutes off his PB is incredible. “Mark gets a lot of plaudits for his times and achievements but what is really impressive is his bravery and courage. 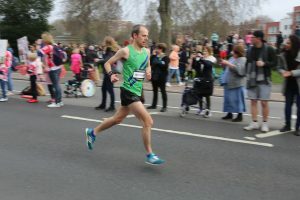 Just ahead of Mark, the race had a dramatic climax, the long-time leader Dan Nash losing his massive lead to Stuart Hawkes in the final mile, the Tipton Harrier winning for the second year in a row in a time of 2:22.33. But, unknown to the huge crowds on the seafront, the outcome was decided, just like most Formula One Grands Prix…. in the pits! Young Welshman Nash had been forced to make not one but TWO unscheduled stops to use the portaloo facilities. The ladies was also won for the second successive year by Helen Davies, of Ipswich, in 2:38.41. Roadrunners’ second man home, Paddy Hayes, slashed a massive ten minutes off his personal best … and then treated us to a brilliant summation of the big event. “Brighton was where it all began for me,” said Paddy (below). 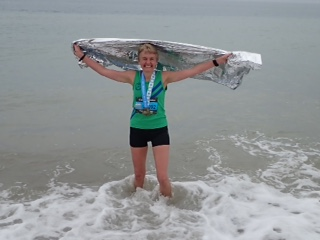 “It was my first marathon in 2015, where I first felt that awful feeling of running completely out of available energy and trying to push on for the final few miles without slowing too much. I felt that again last Sunday. “I was trying to bring my PB down from 3:14.34 to something much quicker, so I gambled and went with the sub-3hr pace group. “I knew it wouldn’t last, but I wanted to see how long I could cling on for. I enjoyed the first half immensely, despite or maybe even because of the ups and downs around Rottingdean and Ovingdean. “The fourth quarter of the race was pure punishment. The sub-3hr group had gone away around half way, and I focused on seven-minute miling until around mile 22. “In an otherwise scenic race, the stretch around Shoreham port is painfully uninspiring. The power station, sawmills and warehouses aren’t much to look at and there are relatively few spectators. “After turning for home I had to keep asking my legs for one more mile at 7min pace, then one more at 7.15 as fatigue began to bite. “Eventually the race re-joins the seafront promenade, the finish line now in sight, albeit three and a half miles away. I crossed the line at 3:04.02, feeling that familiar combination of appalling pain and elation. “It’s worth repeating just how much difference is made by the support of fellow Reading Roadrunners, both spectating and running. “It was particularly cheering to see Mark Worringham over at the head of the race. 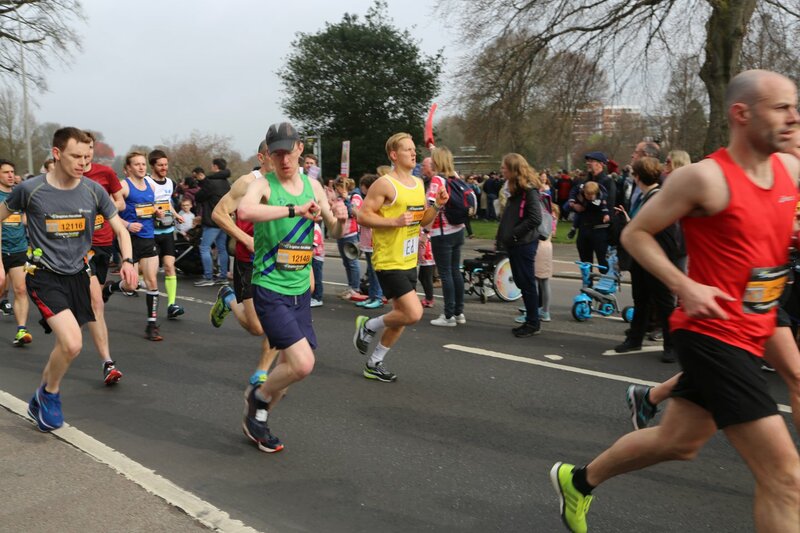 “Naturally I was pleased with my time but I later spotted that the London Marathon have tightened up their Good For Age criteria and capped the number of places. 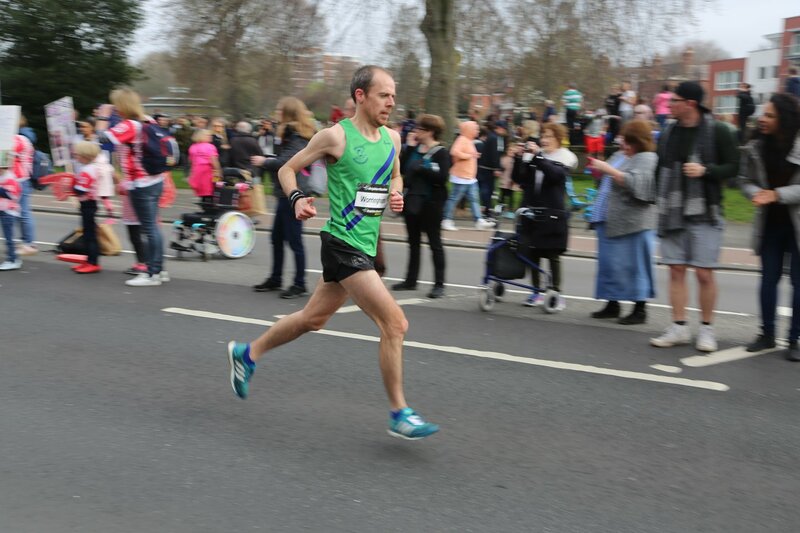 For Paddy’s training partner, Dan Brock, the race had a contrasting outcome… no PB but a Good For Age qualification. The British Airways long-haul captain finished in 3:11.58, slightly off the pace of the 3:09 he ran at Abingdon last year. He plans to use that GFA qualification to run Chicago in October and use his Brighton certificate for Boston next year. “These are both places we fly to on the jumbo,” said Dan, “but I think I’ll go as a passenger for the races. “Boston is a favourite destination of mine as the city is setup for running and whenever I’m there I’ll always run. Dan (right) will be one of eight Roadrunners in the Simon Davis training group heading out to next month’s Copenhagen Marathon, and he had plenty of praise for his team-mates. Another Roadrunner to return an outstanding time was Chris Buley, finishing his very first marathon in 3:21.17. “I didn’t know what to expect and it was a really enjoyable experience,” said Chris. “I loved every moment of it and was very pleased with my time. “Running towards the power station was particularly tricky and the only dull part of the race. “I was going really well until mile 21 when I had severe cramping in both legs. My left leg cramped and then my right… it was agony! I’ve never had such bad cramp. “Next time I have to be a bit smarter with fuelling for the last five miles as, for once, my fitness felt great. Improver-of-the-day title went to Michael Hibberd (3:21.38), who chopped a massive 28 minutes off his previous time, while Mark Andrew (3:25.32) had to settle for a two-minutes improvement. Roadrunners’ first lady to finish was Jane Davies in 3:41.35, and it was the start of a bitter-sweet week for her. “That’s well outside my PB of 3:22.08 which I ran in London in 2013, so I’m about four minutes a year slower,” she said. But Jane’s mood changed from disappointed to euphoric a couple of days later when she learned she had been called up for the England Age Group Masters marathon team. Her performance at Brighton, after which she cooled off in the sea (left), sparked an email from England Athletics confirming her selection to represent her country against a Celtic Nations team on a date yet to be announced. Jane’s performances for a lady approaching the closing months of her spell in the FV55-59 age category never ceased to amaze, as do those by the inimitable Ashley Middlewick. Ashley’s body of exercise for the weekend consisted of a cycle ride from Reading into London on Saturday, another from South London down to Brighton on the morning of the race and a further ride home afterwards. In the middle of all that he contrived to slip in a parkrun at the new Hazlewood course in Sunbury-on-Thames, where he was the FIRST finisher. Oh, and he ran the marathon in 3:08.03. 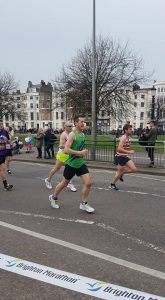 The day’s racing at Brighton kicked off with a 10k in which both Roadrunners competing, Vroni Royle and Nicola Gillard, chalked up personal bests. They were no doubt helped by being pulled along by a high-class field with pacemakers… but not by stopping for their drinks!